I am very excited to announce that my recipe for Sweet Potato Black Bean Enchiladas has won the Whole Foods Market Budget Recipe Challenge. A hearty thank you to all who voted for the recipe- and highlighted this gluten-free vegetarian entry. I am overwhelmed by the support. Over 1,300 of you took the time to vote! And I appreciate it with all my heart. Congrats to the other talented finalists who participated with their mouthwatering array of unique dishes- Jaden of Steamy Kitchen, Rachel of Coconut & Lime, Hannah of Bittersweet, Michael of Cooking for Engineers and of Katy of Sugar Laws. Your recipes rocked. Many congrats to you!!!! I am so happy for you!! Thanks for all you do to help the gluten free community and to help spread the word about celiac. 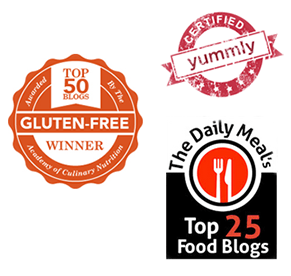 You give us hope and encouragement to keep going and to know that the gluten free lifetsyle rocks!! Congrats on your win! I can't wait to try this recipe! I found your blog through your winning announcement on the Whole Foods blog...I'll be adding you to my reader asap! Thanks for sharing all your hard work! I am so excited for you! Congratulations, Karina! congrats! This recipe sounds absoultely delicious, can't wait to test it out on my kitchen! Woo Hoo! I am so happy you won! That is my super favorite "go to" recipe, too. Hey, Sparky is a cutie! Its great to see gluten-free win and become a bit more mainstream. I personally cannot wait to try this recipe (live in a dorm so cooking in the communal kitchen is not really an option...too many crumbs floating around) but I will certainly make it as soon as possible. Love the other recipes i have tried here! Congrats! You are a fabulous chef. This recipe was great and so are your others. You have been a life saver to a new GF/dairy/soy/corn intolerant gal. Keep up the great work, words, and sense of humor. It all gives me encouragement each day. Congrats! It's so great that gluten free and celiac is being publicized and the more awareness we get, the better everyone is for!!!! It is also nice to show the world that gluten free doesn't have to taste disgusting!! Congrats! I love your recipes and your blog! Keep up the great work! -PS- What did YOU winn for this?! Congratulations! I read and voted for your recipe and made a note that I wanted to try it. I haven't had enchiladas since I went GF. Tonight a friend called who is having us for dinner and she was telling me about this cool sweet potato and black bean recipe she found on the WF site and that maybe she could make it when we come to dinner. I'm excited to try it next week! Go Gluten Free and Go Sparky! I had a stuffed mountain goat named Moses once and he was a bit dusty so I threw him in the wash and his long "fur" shrunk and now he is a big horned sheep. I still feel guilty. Congratulations! I can't wait to try this recipe - it looks so yummy! I have loved all of your recipes that I have tried so far (as does my non GF co-worker - I bring her samples). :-) I would have never thought to pair black beans with sweet potatoes - but reading the recipe - it sounds like a wonderful combination. I can't believe healthy and gluten-free can be so delicious! As a Mexican-American, I have been mostly disappointed in healthy versions of the food I grew up with, but I am discovering some wonderful alternatives here on your blog...followed the link from your win at Whole Foods, congratulations! Congrats! I just saw that on the WF site and thought, "oh yay!" Congratulations! Funny, my favorite enchilada recipe is also sweet potato and black beans but is totally different! I will have to give yours a try. Congrats!!! I love trying out your recipes even though I rarely comment on them. What a way to go!!!! Congratulations on your winning recipe. I can't wait to try it! I also thank you for sharing your gluten-free creations. My gluten-intolerant husband appreciates you too! You have no idea how much your blog has helped me help my 16 year old daughter. You have been a blessing. Congratulations! The recipe was sooo good, too! You definitely deserved it. Very happy for you. I've been trying to accept the fact that wheat and dairy give me really bad random headaches and sugar isn't a whole lot nicer to me. I wish it was digestive or happened all the time. Then I might not be so tempted to cheat. Your recipes help though! congratulations karina!! how exciting! this is definitely my favorite recipe of yours, so i'm so glad it will be shared with so many more people now. Yay! Yay! I'm so happy that you won, you have really helped a zillion gluten free people and lit the way for many of us in the kitchen. Congratulations on your win! I love your blog, and I can't wait to try the winning recipe! Congratulations Katrina! Since my diagnosis of Celiac Sprue in January, your blog has brought me great hope that this new lifestyle is one to be embraced and rejoiced. Congratulations, I have been wanting to try that recipe, I love anything with sweet potatoes! Congratulations! I have made this recipe before and LOVED it!!! I will make it again soon in honor of your win and because it is FREAKING awesome!!!! Congratulations on winning! It's finally getting cool enough here to use our oven and I can't wait to try these. Congratulations! That's wonderful - and I definitely have to try this recipe! Thanks for all the gluten-free dishes. Congratulations on the win! Way to see a veggie recipe represent!!! Congrats! That is so cool--wow! CONGRATS! I knew you would win! This recipe is delicious and very practical! It is quick and easy and you are def. a gluten free goddess! Congratulations! I love your gluten free-vegetarian creations! These look so very tasty, no wonder you won. I'll finally be in a place that has a Whole Foods next week! yay! Congrats to you! I love your recipes! I'm going to try this recipe soon...It looks fabulous! Oh and sparky...He's just too cute! Mazal tov! I'm so happy for you! I've made this recipe before - an absolute winner. 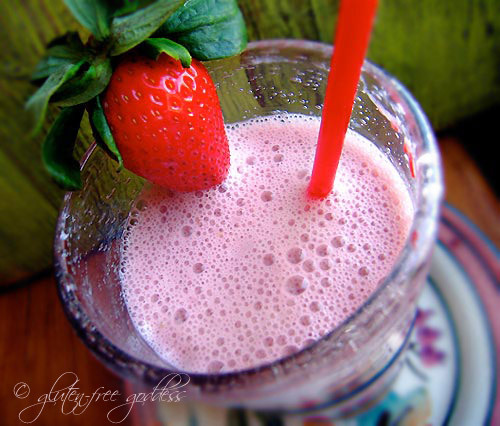 It's unusual, flexible, nutritious, easy, and can be made ahead! YUM! All these well wishers, it's as if you've won on behalf of the whole community. You have, you have, Kari, many congratulations! Congrats on the win! The enchilada's look yummy! As a celiac myself, I really appreciate your delicious, wholesome recipes. Keep em' coming! Yay! I'm really glad you won. Pet Sparky for me. He's so cute! With the country worried about the economy, its great that you came up with a recipe that's gf and economical! Congrats! Wow! How exciting for you and us! This is great to see a gluten free recipe winning against gluten containing ones too!!!! Way to go girl! I am so happy for you! I can't thank you enough for all your advice and help. 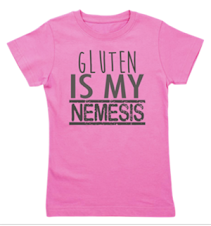 I am newly diagnosed with Celiac Disease and am blessed to have found your site and email. Many thanks and congratulations!! Congrats! And thank you for all the vegetarian, gluten free ideas! Can't wait to try this Award Winning YUM dish! As usual, delicious, healthy, and appealing. Oh, that's so cool that you won. Made this recently, and it was quite tasty. I am so excited to try this recipe. As a grad student with a gluten allergy living on a budget, this is the perfect recipe for me! Thank you so much for creating it and this wonderful website. It has been incredibly helpful. I was so excited when I saw this on the Whole Foods website. My boyfriend is vegetarian. Between my celiac & other food allergies and his being vegetarian we have a hard time coming up with a whole meal that satisfies us both. I haven't had a chance to try this yet, but I'm looking forward to with enthusiasm. Of course I voted for this and I'm so glad you won. Thanks for bringing awareness to celiac and the fact that gluten free food can taste as amazing as gluten containing food. Way to go Karina! It's exciting that you and your recipe were recognized, and it feels good to know that more people will try something GF and think "wow - this tastes great!" Congratulations!! I've been in the kitchen all day with my kiddlets cooking treats out of your Facebook CookBook! Everything we tried got a double-thumbs up! Hi Karina, this is my first time posting (nothing like a possibility of a gift certificate as positive motivation...) - I've tried a bunch of your recipes and really enjoyed them. And I voted for you in the Whole Foods contest because of that. So, whether I get picked in your giveaway or not, the most important part of this comment is to say CONGRATULATIONS to you. You really deserve it. Congrats, Karina! Can't wait to try the winning recipe. Great news! Always enjoy your blog and creative recipes. You deserved to win! Found you from the Whole Story blog. This recipe sounds delicious, and I'm dying to try it on my family. Congratulations! So glad gluten-free can be so good! Congrats on the win! Although I am not celiac, I still enjoy reading your column. We really enjoy your two potato salad with sweet potatoes recipe as well as the Mediterranean Eggplant with crumbled beef. Hey I like Sparky! Haven't seen him before. Congrats - and wonder what happened with the south beach diet. Your comments about hormonal changes and weight were right on for me too. Considering I love sweet potatoes AND enchiladas, this will be something I'll be making next week after I go shopping! Thanks for all your hard work in gluten-free cooking. I actually saw your recipe and voted on the Whole Foods site without ever having read your blog. In the two weeks following I was tested for possibly causes of some osteopenia at only 30 years old and came back for gluten-intolerance. How prophetic! LOL! Now, I am pouring over your website and already made your Chocolate Chip Cookie Bars and Sour Cream Chicken Enchiladas. They were both awesome! Thank you so much for your blog! It's been a lifesaver! Oh yay! That enchilada recipe looks so delicious. Karina, I discovered my wheat allergy in February of this year, and your blog has been such an awesome source of support for me. Thank you! Sounds great - I can't wait to try them! I am so glad you won! Your blog and recipes have been an inspiration to me. Thank you! Can't wait to try the recipe! Keep those GF recipes coming. Congratulations !! I am a great fan of your recipes, blog, photography - you inspire me in many ways! What an excellent blog! So excited to try out some of these recipes! Congrats. I'm reading your recipes because my mother has developed celiac at age 76 and is coming to stay with me for 3 months! Congratulations!!!!! I knew you would win. You are by far the most gifted cook I have ever experienced. Keep on inventing! Congrats Karina! This dish is on my menu this week and I can’t wait to try it. I’ve heard so many great reports. It is very cool that you won. I’m excited for you. Keep those great recipes coming. My family is loving it. Yaay. I was really sure you would win, and I'm so glad you did. So well deserved! Woohoo!!!!! Hearty Congratulations, Karina!! I am so excited for you & I have been rooting for you!! I started entering gf recipes in contests just last year and although i have yet to even make it into the running, I'm SUPER excited that you are getting the recognition that you so rightly deserve for your incredible food!! Here's hoping we see more and more gluten free recipes in contests!! Mahalo for all of your lovely recipes! Sending Aloha from Hawaii! Congrats! We tried these and the are delcious! You deserved to win! That's awesome! I had just checked the WF website the other day to see if they had announced that YOU were the winner yet. This recipe is awesome - I made it down here in Albuquerque for our midwestern visitors that were in town for the balloon fiesta - it was awesome! And they liked the yummy NM green chile too. We had some of the filling leftover and started eating it with corn chips while we were waiting on the oven and that was good too! Congratulations on your win! The recipe sounds great and is now in my pile of recipes to try. I haven't cooked with arrowroot starch before - in fact I don't think I've ever seen it in the store - where do you pick it up and do you think there is a more available substitute? Congratulations, Karina! I'm so glad that your recipe won, and I can't wait to try this recipe very soon. I love your blog and have tried several of your recipes so far, and they've all been wonderful. I can't wait to try more of them! Thanks for taking GFCF mainstream, deliciously! oh my goodness! that is so wonderful. and we'll just have to try that recipe out. looks super yummy! Congrats! I have to say that every single recipe of yours that I have tried has been a major hit. Thanks for all the inspiration. Congrats on the win - I was so happy to vote for your veggie recipe. Mmmm! Your recipes rock and now more people know! Congratulations and keep 'em comin'! Congrats on the win. I am very happy to have found this site with your recipes. My sister and her family have just been put on gluten free diets so she is going to love this when I refer her to your recipes. I can't wait to try these enchiladas myself. Great Work!!!! this is my first week on a wheat-free diet, and i have been SO happy with this site. so happy that i've been looking at yummy recipes and not working all week... oops :) this is my first post and i just want to express how grateful i am for it! wheat free does NOT equal boring. Great job. Can't wait to try the recipe. I have been an avid reader of your site since stumbling upon the link during my countless hours of Google research. I was diagnosed with food allergies (corn, wheat, barley, rye, oats, tuna, pork, hazelnuts - phew!) in August of '07. After a few months of plain veggies, protein and brown rice, I knew there had to be a better way. I found you in the nick of time. congrats. I am so glad to see people taking such an active interest in celiac and our nutrition needs. It's wonderful that you won! I wish you many blessings in the future! Yay Karina!! You go, Goddess! And Yay for gluten-free food! I have benefited so much from your gluten free recipes. how exciting! they look delicious. Congratulations on this well-deserved win! I made your enchiladas the night they first appeared, and everyone in my family loved them. I love your blog because the posts are so filled with Life and provide inspiration for exquisitely beautiful, hopeful, healthful food! Thank you! Congratulations, Karina! And here you are, being generous as ever! I especially like your recipes because I am able to use them here in Belgium--we have fantastic organic stores and I can always find the ingredients you list there, if not at the grocery store. Thanks for all you do on your super blog! Didn't doubt for a second that you'd win! Congratulations! Now to try that recipe . . . .
Yay, way to go! I don't comment on your site very often, but I always read it. Though I'm not a celiac, one of my close friends is. I love to help her find recipes and meals she can eat without worry! Yay! That's great news. I can't wait to make this. You have a wonderful blog! Congratulations, Karina! It's a victory for all Celiac and gluten sensitive folks. What a fabulous way to raise awareness for gluten free living! I look forward to more recipes. As I stated in my comment on the Whole Foods blog, your recipes have cut my grocery bill by about 25-30%; the proof is in my wallet! I make at least one of your recipes each week, many of them already incorporated into the regular routine at the request of my non-gluten free husband. Way to go! You do so much to make the world a tastier and happy place! Well done! I have to try this, it sounds so good. Thanks for scoring one for the celiac community! I love your blog and recipes...I am making your pumpkin bars for a party next week. Your GF recipes have been an inspiration to me. They have helped me learn to be happy with food again and not feel deprived. We LOVED the enchiladas, even though my wife snuck some leftover spinach in when I wasn't looking. Thank you for a great recipe! Congratulations on your win! I've gotten many good recipe ideas from this site. Congrats! I found your blog via the Whole Foods site and I feel like I've won something too. Love the recipes and photos. Thank you! Yippee! Congrats! Let's hear it for Gluten Free Recipes! Hooray! I love this one. Congratualtions, Karina! All your recipes rock! You've helped me make the terrifying leap to happy gluten free living. I'm not even scared anymore! Congrats on the win! You deserve it! What a great recipe...yummy. Congratulations Karina! It is such a great recipe, and worthy of the win. You did it, girl! I'm proud of you! Way to go! It was a wonderful recipe! oh they are so yummy and you totally deserve it!! Congrats Karina! I made these enchiladas last week and they are totally awesome. Your win was much deserved. A little enchilada love makes the world a better place! You deserve to win after all the help you have given so many of your readers! I think it's awesome that people see a meal can be gluten-free & completely "normal" and tasty at the same time! This is exactly how I try to cook! Great job! Yay, I'm so happy you won! I voted for yours because it sounded like perfect comfort food to me. What a wonderful recipe! Congratulations. I might even get my picky eaters to try this one. You have made living without gluten better than "B.K." I am happy for your success, an d wish you many more. Congrats on the win! I made this recipe last week and it was fantastic, I'm really glad I voted for it. Congrats!! They are one of my favorite things of yours and I'm so happy you won! Congrats! I am not a sweet potato fan, but I am really excited to try this recipe! 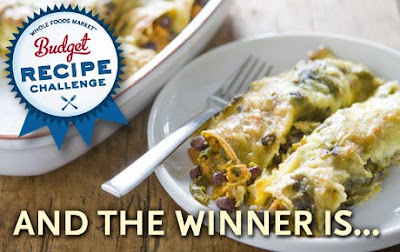 I love enchiladas and can't wait to try these award-winning ones! Rising Tides Rises ALL boats!!! In other words, PAY IT FORWARD!!! Congrats. Love what you are doing! This was my favourite hands down. Affordable and quick AND I know my kids will eat it! That's a winner of a recipe in this house. I am thrilled that gluten-free cooking is getting some good press and I appreciate you blazing the trail with great recipes. Yeah! Congrats! I love your recipes--you are a life saver. Congratulations! What a great twist on a gluten free recipe and what a great way to celebrate your win by giving back to others. Yay, congratulations! I voted for you. Congratulations! You totally deserved the win. Your recipes look awesome, and the few that I've made taste even better! Your recipe sounds wonderful - can't wait to give it a try! Congratulations Karina!!!! You deserve it! Your recipes rock!!!!! A wonderful recipe that just happens to be good for you and gluten free; a beautiful example of your blog. Congratulations! I know that I drafted four votes for you. The recipe is a winner and so a much deserved win for you. HI Karina thanks for using your talent fearlessly. As someone who is dairy and gluten free, I believe your recipes encourage us not to live "without" but to live with abundance. Congratulations, I can hardly wait to try your winning recipe. My friend just emailed the link for the recipe last Thursday and now I'm already a fan. Yay!It's nice to be on the winning side of a democratic vote :) Can't wait to feed these to my fam. Congrats! I'm not at all surprised though... your recipes are THE BEST! And these enchiladas are one of my (and my families) favorites! And you are so right. As mentioned in a previous post, pumpkin and banana add so much to our GF baking. Congratulations Karian. I look forward to trying this recipe. Woo hoo! I love your blog and made this recipe for the first time last week and it was awesome. I'm happy to have discovered your blog. I sure wouldn't mind a gift card to Whole Foods. I shop there, but very sparingly because of the cost. Congratulations hun! You really deserve it. Anybody who shops at Whole Foods out of necessity knows that it can get spendy. So anybody who can come up with cost effective gluten free meals is my personal hero lol. Thanks again for the recipes! It is so wonderful that you won! At last the world at large can get a taste of your terrific food. Glad to see that Whole Foods folks really can see the gold in our kind of food. I can't wait to try this recipe and I've decided to make it for dinner on Halloween! It looks really good and I have been wanting to learn to do green sauce from scratch. Thanks for being GF, vegetarian, healthy and inexpensive! Congratulations. I love your blog and recipes. You have a great voice. I also love the little comments you throw in about New Mexico. I lived in Northern New Mexico for three years before leaving for the Oregon Coast 20 months ago. I don't miss New Mexico as a whole, but there are little pieces that I do miss a lot. I hope you're able to make the move you're seeking soon. Congratulations! I've been reading your blog and cooking your recipes for two years but didn't ever comment until the Whole Foods recipe contest! Awesome job, and thank you for being there when I learned I needed to cook gluten free and casein free for two of my kids! Congratulations ;) We are loving your recipes at our house - thank you!!!! good luck keep it coming! Congratulations! I have made several of your recipes and they are always hits. Now sooo many more people will know about your wonderful recipes! Oh Karina I am SO HAPPY for you!!! Congratulations! I have just recently discovered your blog and I want to thank you for making me feel like I'm not alone in loving food, while being Gluten Intolerant. Thanks a bunch! And again, many congratulations. Congratulations to you! With a daughter that has allergies to eggs, peanuts, tree nuts, peas, wheat and milk...I have been able to use many of your recipes - thank heavens! It is HARD to maneuver, but you make it easier. Thanks and Congratulations again!! I suspected you'd win. :) I've been a silent reader of your blog for months and months. Anyway, you deserve this win. Proud of you! Felicitades on your win! I LOVE your recipes, Katrina. Cooking is again a delicious adventure thanks to you. Of anyone I know, or know of, you deserve this award! All your recipes are fabulous! I love the photography and the fact that I can trust them to be gluten free and some soy and dairy free just makes me want to jump for joy! and Cook!!! Congratulations on your win! Much appreciation for your efforts in keeping the spotlight on the dietary challenges associated with celiac disease. Congratulations! You deserve it, not only for inspiring the GF crowd but our friends as well--your blog is so pretty that my friends have taken to getting recipes off it not only for me but for their own families! Yaaaaay!!! We are all so proud for you (and happy that we helped - just a bit) How nice that we could help you, given how very much your GF/CF recipes have helped us. My family is so very thankful to have you in our lives (and kitchen)! You were there last night, tonight, and again tomorrow night. We are so appreciative and concur with your words and thoughts - be they focused on politics, the beauty/harshness of New Mexico, the joy of family and friends, the trials of changed diets, multitudinous Goddess blessings, or just the love of good food! I have been a fan since the days of your earlier cookbooks, and happened upon your blog after my husband & daughter needed to change their diets. I was overwhelmed. And suddenly, there you were. She works in mysterious ways. Congratulations, Karina! We are so happy for you! congratulations, karina! that is an awesome recipe and i voted for you..it deserved a win! i love your site..i don't post much but i am 'here' alot and love so many of your recipes...thank you for the site..it is a great boon to those of us on special diets!